On December 9, a high profile adoption case comes before the PA Superior Court which will decide whether “the best interest of the child” is to return two girls to their loving but low-income aunt, or uphold an Adoption Court decision placing them with more distant but better off relatives. This is the last chance for the return to Carolyn Hill of her two nieces who were abruptly and traumatically removed from her home by the Philadelphia Department of Human Services in 2012. Their excuses were false accusations and one truth: that she did not have a GED! After Ms Hill’s two-year campaign for justice, the Superior Court will determine whether this family will be reunited or whether those with slender means have less right to family life than those with higher incomes. Local and national groups have weighed in on this important test case with an Amici Curiae Brief filed in support of Ms Hill’s petition for adoption. In addition to the Every Mother is a Working Mother Network, signers include University of Pennsylvania Law Professor Dorothy E. Roberts, the Child Welfare Organizing Project (CWOP), the National Advocates for Pregnant Women (NAPW) and the Statewide Parent Advocacy Network (SPAN). Even after the Brief was filed others have asked to sign, including RISE Magazine and child welfare author and expert David Tobis. lack of court oversight and refusal to hear key witnesses. 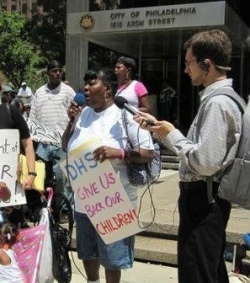 “This decision cannot be allowed to stand, not only for the sake of these two girls who lost their loving aunt, extended family, church and neighborhood communities when DHS engaged in social engineering,” says Phoebe Jones of EMWM, “but for the sake of all children who are removed from homes where poverty, not abuse or neglect, is the ‘crime’. Philadelphia removes children at the highest rate in the country for a city of its size and 1/3 of children would be home tomorrow if decent housing was made available to their parents. About the case: Carolyn Hill is an aunt and a low-income Black single mother who was caring for her nieces at the urging of the Philadelphia Department of Human Services after her sister lost parental rights. All were doing well for a year when DHS abruptly and possibly illegally removed the children who had bonded with her and who she was in the process of adopting on grounds that, in addition to false accusations about cognitive skills and mental health issues, Ms Hill did not have a GED. The children, now four and five, were placed with the wife of a more distant relative at the request of the family as a temporary measure so the children would not have to be fostered with strangers until Ms Hill could regain custody. DHS supported in the adoption proceedings this ”temporary” couple, who have a higher income but who have separated the children from their family, church and community– all of whom fully support Ms Hill in her struggle to get them back. Twelve witnesses took time off of work and other obligations to come to court on June 11, 2014 to testify on her behalf, including her children and other family members, friends, her pastor, neighbors, and others who know Ms Hill well. Yet the only one allowed to testify was the psychologist who conducted an independent parenting capacity evaluation. His evaluation dismissed the findings of a bogus and biased evaluation done by a psychologist contracted with DHS which had concluded that Ms Hill was not able to care for the children. If Ms Hill’s witnesses had been allowed to testify, false and misleading allegations against her character made in court could have been countered and the court given accurate information with which to make their decision. Attorney Samuel Stretton, who agreed to take on Ms Hill’s case pro bono when he heard of the injustices she and the children faced, will argue in Superior Court that it is in the children’s best interest to be returned to the home of Ms Hill where they would grow up rooted in a loving and close-knit family and community sharing birthdays and holidays and special times together. For more info about Carolyn Hill’s case, see The Right to Parent, Even if You Are Poor by Sarah Jaffe, In These Times, July 16, 2014.